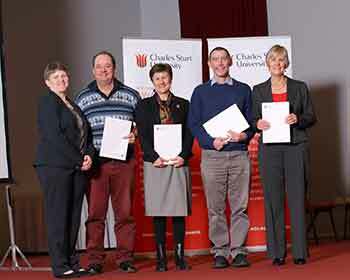 Congratulations to SRA members, Dr Joanne Millar, Dr Rik Thwaites, Associate Professor Rosemary Black, Dr Richard Culas, Dr Lee Baumgartner and Dr Wayne Robinson, who have been awarded the Office of the Deputy Vice-Chancellor (Research, Development and Industry) Award for 'Excellence in Team Research for the SRA program on Improving Rural Liveilhoods in Developing Countries', 2016. CSU's Deputy Vice-Chancellor (Research, Development & Industry) Professor Mary Kelly said the award recognises the team's outstanding contribution to ILWS, the DVC RDI portfolio and the University. Institute Director Professor Max Finlayson said the award was in recognition of both individual and wider research effort. ILWS Adjunct Senior Researcher Fellow Dr Millar said the award recognised the dedication of the team to improving rural livelihoods and environments in developing countries. They have demonstrated passionate commitment to supervising postgraduate students from least developed nations in Asia and Africa, and are conducting applied research with positive outcomes for rural communities. "Not many research programs can claim to have reduced poverty through better environmental management, but this award acknowledges that our research program has contributed to international development using multi-disciplinary research and training methods," said Dr Millar. This SRA undertook interdisciplinary and integrated research with international partners, to deliver effective development programs and policies that improve rural people's livelihoods and environmental management. Research was aimed at understanding complex social-environmental relationships and influencing outcomes for rural and regional people. A major feature of this SRA was the high level of impact in community engagement, capacity building and governance. Build capacity of research stakeholders and partners to achieve the above objectives through mentoring, teamwork, co-supervision of postgraduate students and joint publications. Natural Resource Management and Landcare approaches. Members have research experience in many developing countries including Laos, Indonesia, Bhutan, East Timor, Fiji, Nepal, India, Pakistan, Vietnam, China, Nepal, Vanuatu, Malaysia and Cambodia. There were a number post-graduate students associated with this SRA including from the developing countries of Nepal, Bhutan, Pakistan, Indonesia and Zimbabwe, who undertook research on a diverse range of topics from property rights and rangeland management to communication in agricultural development. Social and economic impacts of conservation lodges on local communities in Botswana and Rwanda. Rural people in developing countries are highly dependent on their natural resources to provide food, shelter, income and cultural needs. However population pressures and inequitable distribution of wealth create competition for resources, land and water degradation and loss of biodiversity. Land uses such as agriculture, forestry and fisheries can impact on ecosystem services creating trade offs between food or wood production and provision of quality water, soil and air. Causes of poverty and erosion of natural capital in developing countries can be geographical remoteness; war and resettlement; rapid urbanisation; unsustainable timber logging, cropping or fishing; climate change causing drought, landslides or flooding; foreign ownership and investment in resources; trade policies; poor governance and lack of education opportunities. The complexity of these issues requires interdisciplinary research to determine social, economic, environmental, agricultural and cultural factors at play, and to develop solutions. Dr Rik Thwaites Community ecotourism and Sustainable Development. The recommendations of further extension training and mentoring of district staff from a project on extension approaches for scaling out livestock production in Lao PDR have been taken up by the Livestock Development Project in Laos aimed at reducing poverty for 20,000 upland households. The recommendations from a project on linking food security and conservation in Lao PDR have been presented to the Nam Theun2 Watershed Protection Management Authority (WMPA). A major recommendation is that, in order to achieve positive local conservation and development action, park authorities must foster more constructive dialogue with villagers in park planning, implementation and evaluation. A project on the socio economic outcomes of community forestry for rural communities in Nepal has provided advice to forestry policy in Nepal regarding social equity and inclusion in community forestry programs. Results from a three year (2012-2015) socio-economic study of fish harvesting and use at the Pak Peung wetland in Laos will enable the Lao government to decide whether to invest in fish passages for environmental and community benefits. A socio economic study of farmer adoption of tilapia fish production in Aceh, Indonesia, which is part of a larger project examining diversification of smallholder coastal aquaculture in Indonesia, has provided provide advice to the Australian Centre for International Agricultural Research (ACIAR) and the Indonesian government on suitable alternatives to aquaculture for farmers, and farmer engagement approaches. Seven tilapia nurseries have been established to facilitate fingerlings access. As a result there has been a rapid increase in farmers growing tilapia, from 30 to 100 in 3 years. Information needs identified in the survey have assisted researchers in providing relevant advice to farmers. Farmers have increased incomes and reduced risk of pond harvest failures. The training and mentoring of fisheries scientists in social research has enabled them to carry out surveys and analysis by themselves. Dr Rik Thwaites, along with co-editors and Institute Adjuncts Dr Bob Fisher, and Dr Mohan Poudel, is working on a new book Community Forestry in Nepal: Adapting to a changing world which draws together findings from the PhD projects of Dr Binod Devkota, Dr Popular Gentle, Dr Mohan Poudel and Eak Rana, along with other authors. The book is expected to be published by Earthscan towards the end of 2016. Delivery of training course on pig nutrition and management in Lao PDR with NAFRI Livestock Research Centre. Millar, J. & Phengsavanh, P. (2013- 2014). ATSI Crawford Fund $8,883 (2013) and $8410 (2014). Gentle, P., Thwaites, R. (2016), Transhumant pastoralism in the context of socioeconomic and climate change in the mountains of Nepal. Mountain Research and Development. 36 (2): 173-182. Silwal, T., Kolejka, J., Bhatta, B. P., Rayamajhi, S., Sharma, R. P., and Poudel, B. (2016) When, where and whom: assessing wildlife attacks on people in Chitwan National Park, Nepal. Oryx, doi:10.1017/S0030605315001489. Gentle, P., Thwaites, R., Race, D., & Alexander, K. (2014). Differential impacts of climate change for communities in the middle hills of Nepal. Natural Hazards (published online: http://link.springer.com/article/10.1007%2Fs11069-014-1218-0 ). Namgay, K., Millar, J., Black, R., and Samdup, T. (2014). Changes in transhumant agro-pastoralism in Bhutan: A disappearing livelihood? Human Ecology. Volume 42, Issue 5, pp 779-792. Poudel, M., Thwaites, R., Race, D., Dahal, G.R. (2014) REDD+ and community forestry: implications for local communities and forest management-a case study from Nepal: - International Forestry Review, 16(1), 39-54. Davaakhuu, O.,Sharma, K. and Bandara, Y (2014), 'Foreign investment in transition economics: Lessons from the experience of Mongolia, Global Business Review, 15 (4), 663-675. Bricker, K. S., Black, R. and Cottrell, S. (eds.) (2013) Sustainable Tourism and the Millennium Development Goals: Effecting Change. Jones & Bartlett Learning, Burlington, MA. Black, R.S. & Weiler, B. (2013) Current themes and issues in ecotour guiding in Ballantyne, R. & Packer, J. International Handbook on Ecotourism, pp. 336-350, Edward Elgar, Northhampton, MA. Cobbinah, P.B., Black, R. & Thwaites, R. (2013). Dynamics of poverty in developing countries: Review of poverty reduction approaches. Journal of Sustainable Development, 6(9), 25-35. Cobbinah, P.B., Black, R. & Thwaites, R. (2013). Tourism planning in developing countries: Review of concepts and sustainability issues. World Academy of Science, Engineering and Technology International Journal of Social, Human Science and Engineering, 7(4), 211-218. Culas, R. J. (2013) The Trends and the Drivers of Deforestation: A Cross-country Seemingly Unrelated Regression Analysis for the REDD+ Policies - Chapter 3, In: Bouza, C. N (edited) Deforestation: Conservation Policies, Economic Implications and Environmental Impact, Nova Science Publishers, Inc. Hauppauge, NY, USA. ISBN: 978-1-62948-241-5. Fisher, R. & Lyster, R. (2013) "Land and resource tenure: the rights of indigenous peoples and forest dwellers." In Rosemary Lyster, Catherine MacKenzie and Constance McDermott (eds) Law, Tropical Forests and Carbon: The Case of REDD+. Pp 187-206. Cambridge University Press: Cambridge etc. Finlayson, M., Bunting, S.W., Beveridge, M., Tharme, R. & Nguyen-Khoa, S. (2013) Wetlands. In Boelee, E. (ed), Managing water and agroecosystems for food security. United Kingdom: CAB International, Wallingford, UK, pp 82-103. Gentle, P., Thwaites, R., Race, D. & Alexander, K. 2013, 'Changing role of local institutions to enable individual and collective actions for adapting to climate change', IASC2013 Abstracts: the 14th Global Conference of the International Association for the Study of the Commons, IASC, Japan, pp. 40-40. Khair, S. M. and Culas, R.J. (2013): Rationalizing Water Management Policies: Tube Well Development and Resource Use Sustainability in Balochistan Region of Pakistan, International Journal of Water, 7(4): 294-316. (ERA: ranked-B). Lei, Y., Finlayson, M., Thwaites, R. And Shi, G. 2013. Migration drivers in mountain regions in the context of climate change: A case study in Shangnan County of China. Chinese Journal of Population, Resources and Environment (3), 1-10. Mustapha, U. M. and. Culas, R.J. (2013). Causes, Magnitude and Consequences of Price Variability in Agricultural Commodity Market: An African Perspective, Proceedings of the 42nd Australian Conference of Economists (ACE2013), Murdoch University, Perth, Australia. 7-10 July 2013. p. 26. ISBN: 978-1-921877-12-4. Photakoun, V, Millar, J., Race, D. (2012) Factors influencing capacity building for livestock development in Lao PDR: strategies to improve outcomes for upland rural development. Journal of Mekong Societies.Vol 8 (1) pp 137-159. Cobbinah, P.B., Black, R. & Thwaites, R. (2011) Reflections on Six Decades of the Concept of Development: Evaluation and Future Research. Journal of Sustainable Development in Africa,13(7). pp.143-158. Millar, J. and Sengdala, B. and Stelling, A. (2011) The role of livestock in changing upland livelihoods in Lao PDR: Facilitating farmer learning according to ethnicity and gender. Journal of Mekong Societies Vol 7 (1) pp.55-71. Stelling, A., Millar, J., Phengsavanh, P., & Stur. W., (2009) Establishing learning alliances between extension organisations: Key learnings from Laos. Extension Farming Systems Journal 5 (1): 43-52. Bricker, K. S. Black, R. and Cottrell, S. (eds.) (2013) Sustainable Tourism and the Millennium Development Goals: Effecting Change. Jones & Bartlett Learning, Burlington, MA. Bricker, K.S. ; Black, R. and Cottrell, S. (2012) Sustainable Tourism and the Millennium Development Goals: Effecting Change. Jones & Bartlett Learning, Burlington, MA. Cobbinah, P.B., Thwaites, R, Black, R. (2015). Ecotourism as a Mechanism for Achieving a Green Economy in Developing Countries: Experiences from Ghana. In: Reddy, M. V. and Wilkes, K. (Eds.) Tourism in the green economy. Routledge. Pawar, M. (2013). International Community Practice: Local-Global issues and strategies. In Marie, Weil, Michael Reisch and Mary Ohmer, Handbook of Community Practice. California: Sage. Bricker, K.S., Cottrell, S. & Black, R. (2012) An introduction to tourism and the millennium development goals in Bricker, K. S.; Black, R. and Cottrell, S. (2012) Sustainable Tourism and the Millennium Development Goals: Effecting Change. Jones & Bartlett Learning, Burlington, MA. Black, R. (2012) Partnerships in practice: Ecotourism and sustainable tourism accreditation and certification programs in Bricker, K S.; Black, R. and Cottrell, S. (2012) Sustainable Tourism and the Millennium Development Goals: Effecting Change. Jones & Bartlett Learning, Burlington, MA. Black, R.S., Bricker, K.S. & Cottrell, S. (2012) Ecotourism and sustainable tourism: Transitioning into the new millennium with future opportunities and challenges in Bricker, K. S.; Black, R. and Cottrell, S. (2012) Sustainable Tourism and the Millennium Development Goals: Effecting Change. Jones & Bartlett Learning, Burlington, MA. Amoateng, P. (2015). Urbanisation and the loss of inland water systems: evidence from Kumasi, Ghana. Paper presented at New Zealand Freshwater Society (NZFS) and Australian Society of Limnology Conference, Nov 23-26, Wellington, New Zealand. Poudel, M., Thwaites, R., Race, D., Dahal, G.R. (2013) Analysing REDD+ in Community Forestry: Has it Been Experienced Differentially at Different Households? IASC2013 Abstracts: the 14th Global Conference of the International Association for the Study of the Commons, IASC, Japan. Dr Tashi Samdup, Director of the Council for Research on Renewable Natural Resources, Bhutan and co-supervisor of two ILWS PhD students, Kuenga Namgay and Karma Tenzing. From that linkage, a collaborative research and capacity building plan has been developed which has resulted in delivery of training on social research methods in Bhutan, and a grant application to the Darwin Initiative for a Community Rangeland Care project. Two international researchers Dr Mardiana Fachry, Senior Lecturer in Socioeconomics of Fisheries from Hasanuddin University, Indonesia, and Dr Malavan Chittavong, Faculty of Agriculture, National University of Laos. Both are working with Dr Joanne Millar on ACIAR funded projects in their respective countries. The Lao fish migration team (Dr Lee Baumgartner, Jarrod McPherson and Dr Wayne Robinson) facilitated the installation of the first ever fish-friendly irrigation gate in the Lower Mekong Basin on June 24, following four years of targeted research and development. The team worked with an Australian company, AWMA Solutions, to come up with a design that helps alleviate fish welfare issues. Field assessments will be performed to ensure fish are passing downstream successfully. The team are co-investigators in a project led by Dr Craig Boys, Fisheries NSW, "Improving the design of irrigation infrastructure to increase fisheries production in the floodplain wetlands of the Lower Mekong and Murray-Darling Basins." A workshop was held, February 3 to 6, at the University of Agriculture, Faisalabad, Pakistan as part of a scoping mission to finalise a proposal for the ACIAR funded project Improving groundwater management to enhance agriculture and farming livelihoods in Pakistan. It provided an opportunity for Dr Richard Culas, Associate Professor Catherine Allan , Dr Michael Mitchell and Professor Jay Punthakey (Adjunct) to meet with the project's in-country partners and the ACIAR support team. Dr Joanne Millar addressed the AGM of the Australian Landcare International committee in Melbourne on 15th November 2015. She presented examples of her research and development work in Laos, Indonesia and Bhutan. discuss the problem of yak/cattle numbers which are causing overgrazing,tree lopping and severe gully erosion leading to declining livestock production and loss of biodiversity. A project plan has been developed to fence off gullies, plant native trees and pasture plots, research red panda populations, trial a biogas unit and install fuel efficient stoves. A grant application will be submitted to the Darwin Initiative (a UK funding program focused on biodiversity and poverty alleviation). Partners include the Ministry of Agriculture and Forestry and WWF Bhutan. Could Landcare work in West Sumatra? be applied and what research might be needed. Challenges and Strategies for the Asian Century, organised by the Asia-Pacific Branch of the International Consortium for Social Development (ICSDAP) and hosted by the Department of Social Work, Visva-Bharati, Sriniketan, West Bengal, India, January 16-18, 2015. The seminar was co-lead by Professor Manohar Pawar, member of the ILWS and President of the ICSDAP. SRA leader, Dr Joanne Millar and Mr Horrie Poussard from Australia Landcare International gave a presentation to Yea Wetland Group and Upper Goulburn Landcare Network on the fish passage project in Laos. The Yea group provided funding for planting of 500 trees and grasses on World Environment Day 2014 to stabilise the banks of the new Fish Passage at Pak Peung wetland near the Mekong River. Associate Professor Rosemary Black provided technical assistance to Birdlife Botswana on environmental education and avitourism. Dr Black also presented a public lecture at the University of Botswana on the role of the tour guide in creating a sustainable tourism industry. The lecture was attended by government policy makers, tour guides, tour operators and the general public. Naveed Aslam Development of quality control protocols for implementation of smallholder dairy farmers. David McGill Breeding dairy animals in Pakistan: Modifying selection and analysis for a more profitable future. Sahibzada Shaffiulah Khan The development of a simulation model to analyse the productivity and financial viability of dairy farms. Muhammad Shoaib Tufail Development of Village-based forage seed production system for the sustainability of smallholder farmers of Pakistan.